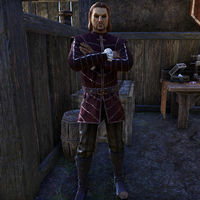 Cuilalme is an Altmer enchanter who can be found at his store, Fine Enchantments, in Vivec City. If engaged in conversation, he will say: "Ah, nothing says luxury like dust covering every inch of your store. It's only matched by the sounds of construction day and night. Lovely, isn't it? What can I get you today? ", "Vivec City, home of the best and brightest, they told me. Well it doesn't look very bright to me, not under a layer of grime. Despite the dust, do you care to look at my wares? ", "My store may be the only enchanting thing about this city. And you can tell any of those Dark Elves in charge I said so. Now, what can I get you today? ", "I came to Vivec City with dreams of an elegant little shop, right in the heart of the city. Instead I'm stuck in the mud with the rest of the squabble. Well, what do you need?" This page was last modified on 7 January 2018, at 19:39.